Here are some ideas for bridesmaids bouquets. As well as looking beautiful, they also also provide the nervous bridesmaid something to do with her hands. I just love this photo (seen above) from one of our recent wedding, it just shows you how beautiful everything looks when the flowers and colors are coordinated. I often create bouquets for bridesmaids that are similar to the bride's but on a smaller scale (see photo above and below). Nobody wants to outdo the bride on her big day. 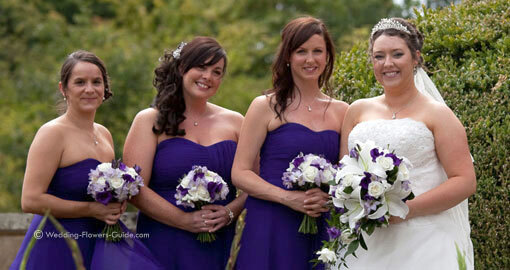 Hand-tied or posy style of bouquet are particularly popular styles of bouquet for bridesmaids. 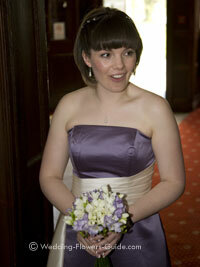 The photo below shows a bridesmaid with hand-tied posy bouquet of freesias in ivory and lilac purple. Alternatively a color theme can be chosen that works best with the color of the bridesmaids dresses, and complements the overall color theme of the wedding. If you are struggling to think of an appropriate color for the bridesmaids bouquets, it is difficult to go wrong with white. This will work with any color of bridesmaid dress and will not fight for attention with the bride's flowers. 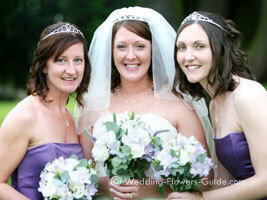 In the photo here (below) you can see the bridesmaids holding posy bouquets of white calla lilies. The white stands out really well against their deep red dresses. Roses and calla lilies are the two flowers that we get asked for most when making bridesmaids bouquets. Both of these flowers are available in a wide range of colors, and can be made into elegant posy style bouquets. As an alternative to bridesmaids bouquets, you could have pomanders. These are sometimes called flower balls, which is a term that describes them exactly: a ball of flowers finished with an elegant ribbon or tulle handle. These are quite easy to carry as the handle is slipped over the wrist. These are a great for young bridesmaids or flowergirls as they are so easy to carry. Here (photo above) you can see one I recently made from crysanthemum daisies. I've given it a blue ribbon handle and bow to coordinate with the color of the adult bridesmaids dresses. Young girls love them because they can carry them like a handbag. Adult pomanders or kissing balls (as they are often called) can be made from roses (as in the photo left), but you can be as adventurous as you like with the type of flower used. 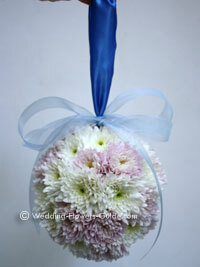 Gerberas, chrysanthemums and carnations will all make great pomanders. These are less expensive than roses but still just as pretty. You can use a flower to match the brides bouquets or choose an alternative flower that is in the same color. I always ribbons that coordinate with the color of the bridemaids dresses. You could provide your bridesmaids with elegant handbags that are finished with a beautiful corsage. This will both look attractive, and the handbags can be kept as a thank you gift. Alternatively they could all wear wrist corsages made from flowers that match the bridal bouquet. These are really popular for bridesmaids that need their hands free to control young flowergirls. If you have very young bridesmaids or flowergirls, you could give them a container or basket full of flower petals instead of a bouquet (see photo below). These 'flower girls' will enjoy tossing the petals down the aisle prior to the brides' arrival. In the photo below small galvanised buckets have been filled with rose petals. If you want your bridesmaids to have real flowers but are worried that a bouquet may be too heavy for them to hold, you could use a flower basket. 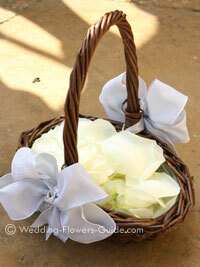 A basket arrangement has the advantage that it can be put down without damaging the delicate flowers. This could be ideal for younger bridesmaids. Instead of having your bridesmaids bouquets all the same, you could give a different flower bouquet to each one. Co-ordinate these with the bride's bouquet. For instance if the bride was having a mixed bouquet of tulips, roses and gerberas produce a single bridesmaids bouquet of just tulips, another of just roses and a third of gerberas (like those seen in the photo below). 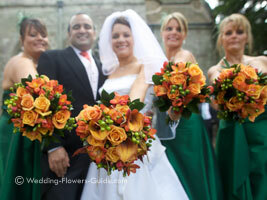 Don't fancy having traditional style bridesmaids bouquets? Click here to read our article on bouquet alternatives.